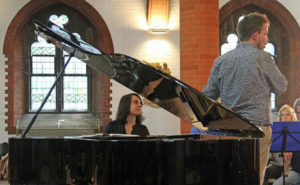 Geoff Ward, reviewing for the Herts Advertiser, was full of praise for SASO’s ‘Russian Highlights’ concert on May 12. He was delighted by Alissa’s Firsova’s “assured, fresh and polished performance” of Tchaikovsky’s mighty Piano Concerto No 1 and the sensitive accompaniment provided by the orchestra. In Shostakovich’s ebullient Festive Overture the orchestra showed “real energy and flair, with particularly good playing from the brass”. While Stravinsky’s 1945 Firebird Suite was “particularly pleasing in the quieter movements, especially among the woodwind.